This Holder for Cartridge Packs design was very similar to what we would recognize as stripper clips today. It was used in conjunction with his box magazine firearm designs. On December 6th, 1892 John Moses Browning was granted US Patent 487660. 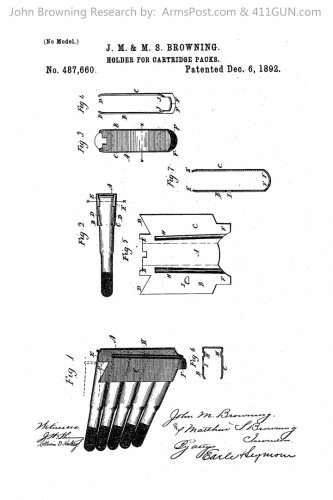 He had applied for this patent on March 22nd, 1892.